The weather has been KILLING me! I need nice warm and dry weather so things like epoxy and gel coat can dry in a reasonable time frame. This past week I've been able to something sanded and get one coat of some goop applied just as the rain starts back up. Yesterday I had a layer of gel coat about 15 minutes into its set up when a soaking rain started. By the time I got the plastic laid out on deck, things were so wet the tape didn't stick very well. To add insult to injury, a gust of wind grabbed the plastic and stuck it into the gel coat, which made a MESS as I pulled it back up. Suffice it to say, I had repairs to make today. The picture at let shows the corners with the gel coat applied but not yet sanded. I have to admit I'm having a really nasty time with color matching. I picked up a tube of yellow to try dulling the brilliant white, but it seems that no matter how little I use it still makes the whole batch turn to a dandelion color. I had to throw away two batches, wasting not only time but money. Finally I gave up in the interest of progress and just went with the white. The good news is, only a tine margin of what shows here will actually be visible once the hatch is installed, so it's not as bad as it looks. 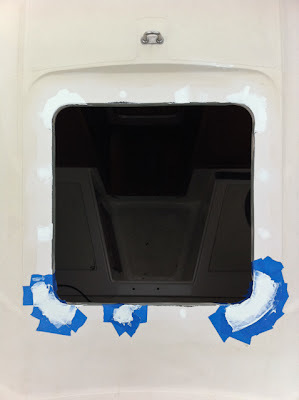 Most importantly, it will do a good job sealing the fiberglass and protecting the boat as it should. I can deal with a little aesthetic impairment as long as the rest of the workmanship is up to par. At some (not too distant) point I'm going to need to paint the decks anyway, so this is a short term issue. If I can get a break in the weather tomorrow night I should be able to get this sanded and ready to compound. That lines me up for a hatch installation this weekend, again, assuming the monsoons hold off. The weather is certainly making things difficult for me, but I'm still moving forward. I was able to get the backing plate treated to its first coat of epoxy this evening, and after a sanding, will lay down a second coat tomorrow to ensure everything is sealed up well. I don't ever want to have to take this thing out once its installed, so it's important to do the job right. One more piece of good news came today via FedEx, and that is the parts from Edson I needed to finish the pedestal overhaul. I have the parts laid out in the garage now, and it seems pretty straight-forward. I'm going to get the Raymarine X-5 SmartPilot components installed on the wheel and pedestal before moving things back out to the boat. It's going to look and feel great having all that back in the cockpit after a year of having it covered by a plastic bag.